Otitis, or ear infection, can affect the external, middle or the inner part of the ear. Middle ear infection is a common form of ear infection. The “middle ear” is the air-filled part of the ear that lies just behind the ear drum. Doctors cannot normally see the middle ear, but many middle ear problems will produce changes in the appearance of the ear drum that allow an appropriate diagnosis to be made. Ear infection can occur suddenly, leading to acute otitis, or can last longer, as in chronic otitis. Middle ear infections may occur following a cold or other virus, with nasal allergy symptoms, or they may develop without a known cause. Ear infections are much more common in children than adults. For that reason, most of the information on these pages is geared toward children, although the same recommendations apply to adults as well. Middle ear infections (otitis media) develop when bacteria or viruses get inside the ear and begin to multiply. These bacteria and viruses often enter the body as respiratory or other infections, such as the common cold or a viral sore throat . Children have eustachian tubes which are smaller, more level, and straighter than those in adults. 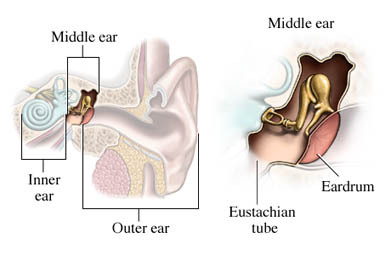 The eustachian tubes connect the middle ear with the back of the nose and help to stabilize air pressure within the ear. The difference in anatomy makes it easier for bacteria to enter the middle ear from the nose and throat. Children have larger adenoids than do adults. The adenoids are tonsil-like structures located just out of sight at the junction of the back of the nose and the upper throat. Like tonsils, adenoids tend to be much bigger in childhood than later in life. Ear infections may be more likely to develop when swollen adenoids block the nearby openings of the eustachian tubes. Ear infections are the most common infections in babies and young children. It is estimated that 3 out of 4 children under the age of 3 will experience as least 1 ear infection, and half of these children will have 3 or more ear infections by the age of 3. Although ear infections themselves are not contagious, the colds and other infections that frequently lead to ear infection can be passed from person to person. What are the risk factors for ear infections?What are the symptoms of ear infections?How is ear infection diagnosed?What are the treatments for ear infection?Are there screening tests for ear infections?How can I reduce my risk of ear infection?What questions should I ask my healthcare provider?Where can I get more information about ear infections? Acute otitis media (AOM). EBSCO DynaMed Plus website. Available at: http://www.dynamed.com/topics/dmp~AN~T116345/Acute-otitis-media-AOM . Updated May 17, 2016. Accessed September 27, 2017. Ear infections in children. National Institute on Deafness and Other Communication Disorders (NIDCD) website. Available at: http://www.nidcd.nih.gov/health/hearing/pages/earinfections.aspx. Updated May 12, 2017. Accessed September 27, 2017. Middle ear infections. Healthy Children—American Academy of Pediatrics website. Available at: https://www.healthychildren.org/English/health-issues/conditions/ear-nose-throat/Pages/Middle-Ear-Infections.aspx. Updated February 22, 2013. Accessed September 27, 2017.